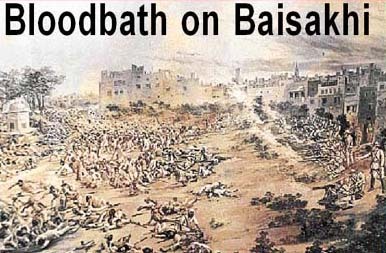 Jaswant Singh recounts the massacre that rocked an empire. TWO armoured cars rumbling through the streets of Amritsar halted in front of a narrow lane. The soldiers marching alongside also stopped. The lane was too narrow to let the armoured cars in. Brigadier-General Reginald Edward Harry Dyer alighted from his car and cast a disappointing look at the narrow opening and ordered his men — 25 Gorkhas and 25 Baluchis armed with rifles and 40 Gorkhas armed only with khukris — to follow him. At the end of the lane lay a rectangular piece of unused land, a dust bowl covered partly with building material and debris, known as Jallianwala Bagh. It was surrounded on all sides by walls of buildings. The General posted his men on raised ground on each side of the opening. About 100 yards from where the General stood, a man was addressing a crowd. Some half-listened to him, some slept on the ground and others simply gossiped. As shots rang out, horror struck the gathering and the people ran towards the surrounding walls and the three narrow exits from the Bagh. The soldiers fired into the crowd. The General directed the fire to spots where the crowd was the thickest. Some tried to scale a low section of a wall. Dyer directed the fire towards them. Corpses fell in heaps at the base of the wall. Those who managed to scramble over the walls, dropped dead from their wounds in the alleyways outside. Soon the lanes were choked with bodies as was the bagh itself. The death dance continued for 10 minutes. The soldiers fired. reloaded and fired as directed by the General. When they had expended all their ammunition, Dyer ordered them to withdraw. Without so much as casting a glance at the carnage, he drove back to his headquarters in Ram Bagh. The year was 1919. Punjab was seething with discontent. The First World War had just ended and Punjab felt it had suffered more from the war than most other parts of the country. Food prices had rocketed on account of exports to Europe. Punjab had provided the bulk of recruits for the army. But the methods employed by the administration of Sir Michael O’Dwyer, the pugnacious Lieutenant-Governor of Punjab, to obtain war loans and to mobilise men for the army were widely resented. O’Dwyer never made any secret of his special contempt for the educated urban Indians.But he had also alienated a large chunk of the rural population by his brutal methods of recruitment. Lambardars had to furnish recruits on pain of forfeiting their lambardari rights. Tehsildars would visit villages or call all inhabitants of a village to the tehsil headquarters and pick out young men for recruitment. After the First World War, the Government felt the need for replacing the Defence of India Act, an emergency measure to suppress political movements in India that could have hampered the war effort. In December, 1917, the Government of India named Sir Sidney Rowlatt of the King’s Bench to recommend legislation to curb sedition. He recommended two Bills, commonly known as "Rowlatt Acts". One of these became law. When the Imperial Legislative Council passed this Bill, all Indian members voted against it. Three of them, Pandit Madan Mohan Malaviya, Mazarul Haque, and M.A. Jinnah, resigned. This law empowered the Government to arrest and search people and property without warrant, to detain anyone without trial, and to try people before special courts where there was no right to appeal. The Act raised a storm of protest the kind of which India had not seen before. The law was summed up in the cryptic phrase, "Na appeal, na dalil, na vakil". The movement against it was the most acute in Sir Michael O’Dwyer’s Punjab. In Amritsar, the spirit of the people found expression in a combination of two leaders, Dr Saif-ud-Din Kitchlew, a Cambridge educated Muslim lawyer, and Dr Satyapal, a middle class Hindu who had held the King’s Commission for one year during the war. In Gandhiji, the country found a fierce opponent of the Rowlatt Act. He decided to force the Government’s hand through Satyagrah. He called for a hartal and fixed March 30, 1919, as a day of fasting all over the country. He later changed the date to April 6, because the notice was not considered enough for a nation-wide strike. But the news of cancellation reached Amritsar late and the March 30 hartal was duly observed. O’Dwyer viewed Gandhiji’s call with apprehension and on March 29, forbade Dr Satyapal from making any public speech. The press had already been gagged and certain newspapers were forced to stop publication. Dr Kitchlew addressed a public meeting at Jallianwala Bagh on March 30. Later, he too was prevented from public speaking. Leaders in Amritsar felt that the hartal on April 6 should also be observed. On April 5, the Deputy Commissioner of Amritsar, Miles Irving, called local magistrates and eminent citizens to ask them to get the hartal cancelled. Some of them agreed but Dr Kitchlew and Dr Satyapal refused. The next day, Amritsar was again at a standstill. On April 9, was Ram Navami. The procession this time was different. It had a number of Muslim participants and the crowd chanted "Mahatma Gandhi ki jai" and "Hindu-Musalman ki jai". Hindus and Muslims drank water from same vessels. This fraternisation between the Hindus and Muslims gave the Hindu festival a larger significance. This demonstration of popular national consciousness alarmed Miles Irving and enraged O’Dwyer. He decided to deport Dr Kitchlew and Dr Satyapal. He also ordered that Gandhiji should not be allowed to enter Punjab. The deportation order reached Amritsar on the night of April 9 . The news spread in the city like lightning. Crowds gathered at various points demanding to know where their leaders were. At the Railway Carriage over- bridge, a picket of mounted British soldiers and Indians fired when the crowd surged forward. Three or four persons were killed or wounded. The enraged crowd moved towards the railway foot bridge, carrying the dead and the wounded. Some went towards Hall Bazar. The Deputy Commissioner appeared on the scene but the crowd ignored his entreaties to disperse peacefully. Sticks and stones were thrown at him. In this turmoil, two members of the Bar, Gurdial Singh Salaria and Maqbool Mahmood, were in the middle of the crowd, trying to calm them and at the same time to restrain the authorities from firing. But a volley of stones and sticks was directed at the soldiers who opened fire, killing about 20 persons and wounding many. The two lawyers had a narrow escape. The road became a scene of carnage. Amidst the groans of the injured, a dying man uttered his last words: "Hindu-Musalman ki jai." As the news of the shooting spread, thousands went on the rampage, forgetting Dr Kitchlew and Dr Satyapal. The leaderless mob was now in a frenzy, screaming for revenge. It sacked the National Bank and killed its European manager and accountant. At the goods yard, guard Robinson was beaten to death. At the Alliance Bank, the manager, Thomson, fired shots from his revolver. The mob clubbed him to death and burnt his body with bank furniture. At Rego Bridge, Sergeant Rowlands had his skull battered. The Town Hall, the post office and the Mission Hall were burnt. So was a part of Bhagtanwala railway station. The rioters then headed for the Zenana hospital, searching for Isabel Mary Easdon, the doctor in charge, who, someone told the crowd, had laughed at the wounded men and remarked that they had got what they deserved. The hospital staff hid her from the crowd. Miss Marcella Sherwood, a missionary teacher, who had spent 15 years in Amritsar was cycling through the streets, intending to close the five schools of which she was superintendent and send the 600 Indian students home. The mob chased her and she frantically petalled into friendly streets where she was well-known. But the mob caught up with her, knocked her to the ground and left her for dead. Some Hindu shopkeepers later carried her indoors. The mob learnt that she had survived and pounded at the door demanding that she be handed over. An elderly Indian lady came out with remarkable courage and swore that Miss Sherwood was not inside. As darkness fell, she was taken to her home in a cart, hidden under a pile of blankets. Next morning she was taken to the safety of Gobindgarh fort. Gen Dyer was alerted in his headquarters in Jalandhar. He sent a force of 300 men to Amritsar. On April 11, he was personally ordered to Amritsar. When the General entered the city at 9 p.m. the streets were littered with debris and several buildings were smouldering. Dyer called a meeting attended by the Deputy Commissioner and the Superintendent of Police. A document was drawn up and given to a group of leading citizens. It warned that the army would use "all force necessary" to restore order. Amritsar had been handed over to Dyer. On April 12, he marched through the city with a column of troops. In another part of the city a crowd was being told that a meeting would be held next day at Jallianwala Bagh and that the hartal would continue until Dr Kitchlew and Dr Satyapal were released. Sunday, April 13, was Baisakhi Day and all roads to Amritsar were thronged by pilgrims to the Golden Temple. Dyer decided to make another show of force. In the morning a column of soldiers marched out, followed by two armoured cars, and Dyer’s car. A cart carried a drummer and a town crier who read out a proclamation. The procession halted at 19 points where the proclamation was read. It concluded: "Any procession or gathering of four persons, (or more) will be treated as an unlawful assembly and dispersed by force of arms, if necessary." At his headquarters, Dyer learnt that crowds were gathering in Jallianwala Bagh. He mustered 50 men armed with rifles and 40 Gorkhas armed with khukris and followed the column through the streets. As soon as his force had trotted into position along the ramp inside, he ordered them to open fire on the crowd. When the troops marched out, Jallianwala Bagh presented the scene of a deserted battlefield. The soldiers had fired 1,650 rounds into the crowd. The dead and the dying lay all around and no one ventured into the Bagh in search of friends and relatives till they were sure that the soldiers had really departed. As darkness fell, stray dogs were attracted by the scent of blood, and they feasted human flesh all night. Such was the terror of Dyer’s curfew that no one dared to move out after 8 p.m.
Next morning a deputation met Dyer for permission to cremate or bury the dead. The General granted the permission. Long processions of mourners followed carts piled with corpses. Normal customs were ignored and four or five corpses were cremated on each pyre. No one kept count of the dead. After about four months, the Government declared that the toll was 379 dead and 192 wounded. Unofficial sources, however, counted 1000 dead. The exact figure was never known. Martial Law was declared in Amritsar and Lahore districts on April 15, and backdated to March 30 so that Dr Kitchlew and Dr Satyapal could be put on trial. Some bizarre punitive measures followed in Amritsar. Any Indian who passed any European had to salaam. Those who did not, were flogged. The railways were virtually closed to Indians, as all third class and intermediate tickets were withdrawn. Not more than two men were allowed to walk abreast on pavements. Amritsar’s water and electricity supplies were cut off. A rigid curfew was enforced. Dyer saw the injured Miss Sherwood on April 19, and ordered a whipping triangle to be raised in the lane in which she was attacked, posted pickets at both ends of the lane, and decreed that any Indian who wished to go along the lane would have to do so on all fours. The ‘crawling order’ remained in force till April 24. Martial Law which was clamped on Amritsar and Lahore districts on April 15, was extended to Gujranwala on the 16th, to Gujarat on the 19th and to Lyallpur on the 24th. Public flogging became common in Lahore. Eight hundred tongas were commandeered, 200 of which were detained till the martial law lasted. All cars belonging to Indians were taken over. Manohar Lal, Vice-President of the High Court Bar Association, was arrested because he was a trustee of The Tribune. Kalinath Ray, the highly respected editor of the paper, was arrested, tried and convicted for "seditious writings". The Tribune had to suspend publication. Five hundred students and teachers of S.D. College were arrested because a notice pasted on the gate of the hostel had been torn off. They were marched to the fort, three miles from the college, on a hot summer afternoon, with their bedding on their heads. They were detained for two days and released only when the Principal gave an undertaking that notices pasted on the hostel building would be preserved. Students of DAV College, Dyal Singh College and the Medical College had to walk 17 miles to answer roll calls four times a day. College principals were given "quotas" of students to be expelled, rusticated and given other punishment, according to the "reputation" of the college. In Kasur, people who failed to salaam every white man, were flogged and made to rub their noses on the ground. The biggest six boys were chosen from each school for flogging. In Gujranwala, the hostel of Khalsa School was bombed from the air. A village near the town was machine-gunned from the air. Martial Law Commissions were set up to hold trials of serious cases. But the most important trial in Lahore was the case of Amritsar leaders. The persons on trial came from a cross-section of Amritsar’s society, from the wealthy Dr Kitchlew to traders and small time versifiers who eked out a living by reciting odes at weddings. Dr Kitchlew and Dr Satyapal were sentenced to transportation for life. By this time, London also appeared anxious to end the bitterness. King George V issued a proclamation of amnesty which said: "I direct my Viceroy to exercise in my name and on my behalf my royal clemency to political offenders in the fullest measure which in his judgement is compatible with the public safety." Dr Kitchlew, Dr Satyapal and many others were released. In the House of Commons, Montagu was under pressure for details of what had happened in Punjab. He asked Chelmsford to submit proposals for an inquiry which should be "relentless in coming to the truth". Appalled, Chelmsford warned Montagu that the demand for a wider inquiry came from Indian "extremists" whose aim was to discredit the British administration and to harm O’Dwyer’s reputation. Montagu persisted, and in November, 1919, Lord Hunter, Senator of the College of Justice in Scotland, named by Whitehall to head the Disorders Inquiry Committee, and its seven members reached Punjab. The committee consisted of five British, including Hunter, and three Indian members. The Congress decided to boycott the committee unless the Government released Punjab leaders from jail. Later, after the release of the leaders on November 12, it offered to lead evidence before the committee but the offer was rejected. The Congress set up its own committee to go into the happenings in Punjab. The Hunter committees failed to produce a unanimous report. The majority report was signed by the European members while the Indian members submitted a minority report. The bulky document was published in May, 1920. The Congress report was out earlier on February 20. It was a severe indictment of the British rule in Punjab. Photographs in the report illustrated the brutality of the firing at Jallianwala Bagh. It declared that a number of British officials in Punjab including O’Dwyer and Dyer deserved to be impeached but their dismissal was essential. In the Hunter Committee’s findings, the majority and the minority reports had much in common, only the minority report had used much harsher language. Both censured Dyer for firing without warning and continuing to fire until his ammunition was expended. It was now impossible to put off a decision about his future. Winston Churchill, Secretary of State for War, announced in the House of Commons the dismissal of Dyer from the army. When the House debated a vote of no confidence in the Government’s handling of Indian affairs, it became a debate on the rights and wrongs of Dyer’s dismissal. As speaker after speaker rose, it appeared that the Government might fall on this issue. But Montagu and Churchill carried the day and the House approved the Government’s action. The House of Lords, however, passed a resolution favourable to Dyer. This could not alter the Lower House’s decision but it did give some satisfaction to Dyer and his supporters. Morning Post, an influential Tory paper, launched a fund for Dyer. Contributions came mainly from Englishmen in India. The money thus raised saved Dyer from penury. Living as a recluse on the outskirts of Bristol, he suffered a severe stroke. On his death bed he told his daughter-in-law: "I don’t want to get better. So many people say I did right in Amritsar... but so many others say I did wrong. I only want to die and know from my Maker whether I did right or wrong". He died on July 23, 1927. After the massacre in Jallianwala Bagh, a young orphan from Sunam, who was among the rescuers, swore a solemn oath of revenge. It took the youth, Udham Singh, 21 years to redeem the pledge. At a meeting in London’s Caxton Hall, he fired six rapid shots from a pistol. Two bullets hit one of the guests. The man who dropped dead on the spot was Sir Michael O’Dwyer. Thus was written the last act of the bloody drama that began in Amritsar in the summer of 1919.